The Folgers Jingle Contest 2017 is now taking entries! 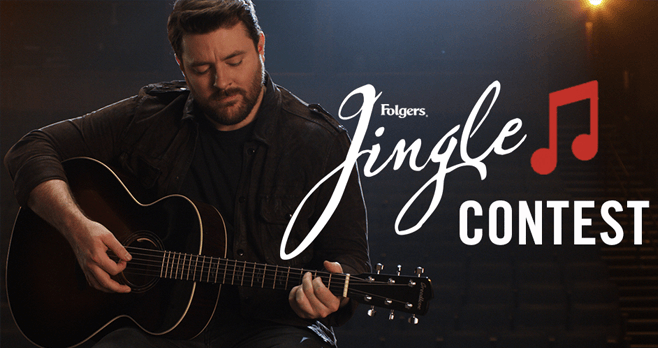 Record your own version of the Folgers Jingle for a chance to win up to $25,000 in cash and a mentoring session with American country music singer and songwriter Chris Young. To participate, visit the promotional website available online at jingle.folgerscoffee.com then complete and submit the official registration form. Next, upload a video displaying an original musical performance of the Folgers Jingle featuring the melody and lyrics of the line “The Best Part of Wakin’ Up is Folgers in Your Cup”. As a result, you will be automatically entered into the Contest. Want more chances to win cash? Enter these Cash Sweepstakes right now! Eligibility: The Folgers Jingle Contest 2017 is open to legal residents of the 50 United States and the District of Columbia, 18 years of age. Sweepstakes Period: Begins on or about Noon ET on January 30, 2017 and ends at Noon ET on February 27, 2017. Limit: Limit up to 2 Entries per email address. Random Drawing: Prize Winners will be announced on or about May 8, 2017. Grand Prize (1): $25,000 (divided among and payable by check equally to each Finalist Team Leader and Finalist Team Member listed on the Grand Prize Winner’s Entry). First Prize (2): $2,500 (divided among and payable by check equally to each Finalist Team Leader and Team Member listed on the First Place Prize Winner’s Entry). Second Prize (2): $500 (divided among and payable by check equally to each Finalist Team Leader and Team Member listed on the Second Place Prize Winner’s Entry). Winner’s List: For the names of Prize Winners, available after May 8, 2017, visit jingle.folgerscoffee.com, or send a self-addressed stamped envelope with proper postage affixed to: The Folgers Jingle Contest Winners List, c/o Centra360, 1400 Old Country Road, Suite 420, Westbury, NY 11590. Requests must be received by 08/31/17. Winners list will be available after all Winners have been verified. Sponsor: The Folger Coffee Company, One Strawberry Lane, Orrville, OH 44667. For complete details, including Official Rules, visit https://jingle.folgerscoffee.com/.